Notes compiled by Michael O'Halloran. The death occurred in his adopted country of New Zealand of Timothy Cahill, formerly of Currabeg, Adare. Timmy arrived in New Zealand in stages as he first went and worked in England, then to Australia and finally set up home in NZ. Born in 1924, he received his education in the Christian Brothers School, Adare. Prior to leaving Ireland in 1947, he was a prominent member of the Kildimo Cross-country Team that achieved many successes in the 40’s. At this time he worked for John Henry Long in farming. In England he with many others from his area, worked with a builder who eventually secured a passage ‘down under’ in 1950. 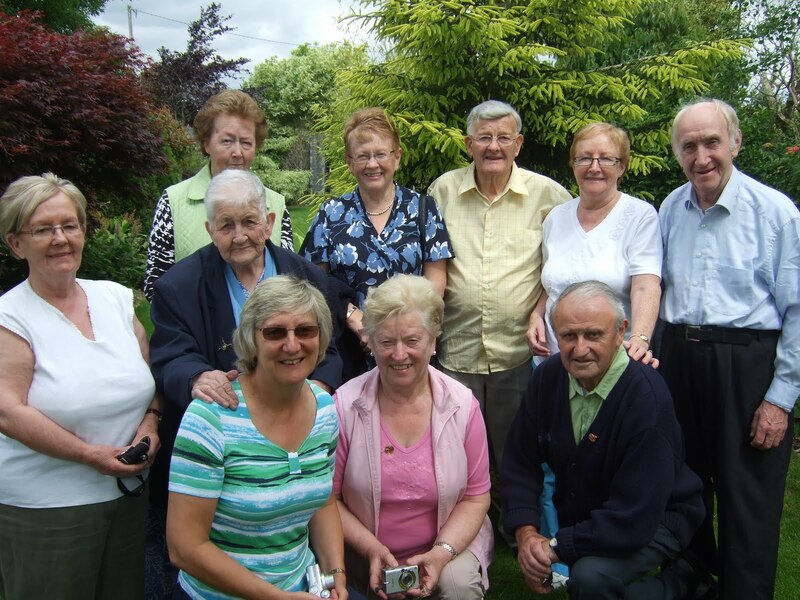 The final leg of his journey came in 1954, where with his wife Nancy McGrath from Ballylanders, they reared a family of four girls- one of whom has settled back in Ireland. In NZ Timmy worked on the railway, where ironically returning home from a social evening, he had a serious accident in which he lost a leg in a railway accident. Following recuperation and with a prosthetic limb, he was promoted from line work to a supervisory position, as indicated in the photo accompanying this article. During this time, Timmy had often said that following his death, his leg was to go to Cambodia, where it might be fitted to another amputee and this wish was finally fulfilled. His cremated remains returned to the family burial place in Cappagh, where he rests with his mother. He was predeceased by his sister Nellie Casey of Co. Sligo and is survived by his brothers Haulie and George and sister Jane Enright, Manchester. Sympathy is extended to his widow and daughters and to his surviving relatives and friends. An average of 160 persons lose their lives in Ireland annually by drowning. In many cases you wouldn’t need to be a spectacular swimmer to save these lives. All levels of swimmers will receive training during ‘Water Safety Week’ for a minimal cost. In our area three centres of training are available with accredited tutors. Askeaton Pool runs courses from 12 – 17 July and from 9 – 14 August, starting at 8.30 am. Copswood Pool has courses from July 26 – 31 and from August 23 – 28, all beginning at 10 am. Both of the above courses cost €40- a small cost for a human life. Glin Pier hosts courses from July 19 – 24 and from August 16 – 21, starting at 11.00 am and 10. 00 respectively. Courses here are influenced by local tides and the cost is €30. All participants of whatever level of swimming competency will receive credits for successful participation. Such credits may eventually lead to qualification as Lifeguards at public swimming venues. Enquiries about training to Michael O’Sullivan at 061 393204. Madeline Mulqueen of has added another beauty award by winning the recent ‘South West Model Search’ in Ennis recently. A model with the Fíona Doyle agency, she now goes on to join Martina Costello, who specialises in recruiting and training models for catwalk shows and for photoshoots. In capturing this prize, Madeline secures a welcome cash prize, a modelling contract and a coveted photoshoot with Patrick McHugh, plus the key to many opportunities in this demanding profession. When not modelling, Madeline is pursuing another career in early childhood studies in Mary Immaculate College, where she is often found participating in their shows and musicals. She eventually hopes to infuse her love of the stage and performance into the young people she’ll teach in the future. Notice any new neighbours moving in? Well, Macra Na Feirme think you should take the initiative and get to know them! Macra suggest a barbeque, picnic or poolside cocktails or even cocktails without the pool. President Mary McAleese and Miriam O’Callaghan are also supporters of the initiative, now in its fifth year. If you’re new into the area and feel a bit neighbourly, why not take the initiative and join a local club. Volunteers are always in demand for local organisations. For example, the local Community Council will welcome you with open arms. If you have horticultural leanings, then Tidy Towns is your place. Want to sing- how about joining any of the two church choirs? There are exclusively women’s clubs, the ICA and the Women’s Group, both of whom do lots of interesting things. Sporting clubs abound. All ages are catered for in GAA and soccer. All sports are available in Community Games where helpers are always needed. You could join the brothers and sisters who fish and shoot- but not at the same time. And if you’re a Rupophobiac or lean towards Mysophobia, St. Joseph’s Church will supply you with dusters and polish. Of course there’s also Mensa and the Kenry Historical Society. This is a ‘must see’ show for anyone interested in the work of Jan Stroud as it is probably her most popular show. It is being staged by Adare’s stagecraft school which has been rehearsing the musical all year and the directors Alison Cowpar Boylan and her partner Gretta are currently up to their eyes in costume making and stage set design. Friday, July 25 at 8.00 pm is when the curtain rises and the adrenaline is released by the boys and girls who have been working hard on the production. Alison and Gretta have taken on this enterprise as a labour of love to cater for local children who have responded from all parts of West Limerick and beyond. Between them they hold a wide selection of the skills necessary to teach and produce shows such as ‘Rainmaker’. They passionately believe in the value of their art in not just producing shows, but in producing the personalities of the seven to fifteen year old children whom they teach. Staging a show like this with twenty two songs over two hours with the requisite costumes, sets, lighting, etc., absorbs much of their finances and they greatly depend on punters to show their appreciation by coming to the Village Hall on the night. You will leave with toes a-tapping. Advance tickets may be got from Alison at 087 9952605. The newly formed and hardworking Tidy Towns group have been instrumental in providing litterbins in the village and environs. Given the difficulty of educating some people to use them, perhaps the general environmentally aware community might adopt the maxim to ‘Bend and Bin’, thereby benefiting the waistline and the village. Take note also of the present floral displays of wild blooms, which are lovingly cared for by the small core of this committee. Good on you girls! ‘De Bucket’ is proving a popular venue for the exhibition of local talented painters and this time it’s the work of the Clarina Active Retirement ‘Thursday Club’ members that is on show and for sale. The exhibitors are all female, giving the lie to the sexist opinion that painting is a male preserve. Viewing is during opening hours and the wide range of the artists’ subjects and the many local and foreign scenes painted ‘en plein air’ can only impress you. This exhibition will be hanging until the end of July. On Tuesday June 29, the Numbers drawn were 2, 3, 17 & 19. Because no punter predicted this combination, Lucky Dips of €20 each were drawn by Bernard Gloster, Ballyculhane; Joe Gleeson, Ballynacarriga; Sean Kelly, Ballyvareen; Mary O’Dea, Ferrybridge and Louise Byrnes of Court. Your €2 ticket to win a Jackpot of over €6,30 is available from the P.O., De Bucket, Slattery’s, Seven Sisters and Dromore Inn. Support your local community lotto. Camp Bosco will run from Monday July 5 to 23. A European Pool Lifeguard Course will take place in Copsewood Pool from July 10 from 10am to 4pm. Participants must be 17 years old and have attained Rescue 2 or Rescue 3 from the Irish Water Safety Syllabus. Further details from Kate O’Hara on 085 1407415. Salesian Secondary College School Review Magazine is for sale in the school office. The Parents Association have organised the sale of second hand books on Tuesday July 6 between 7pm and 9pm in the School Library. Representatives from Tony Clarke’s School Book Shop will attend at the school on Wednesday July 7 from 6 to 9pm to sell new books and stationery. .
An all-weather Artisans Craft Fair will be held on the last Thursday of each month, commencing 29th July. This is an innovative and exciting fair aimed at bringing a wide variety of Ireland’s artisan community together on a monthly basis in order to showcase their talents to a large audience.